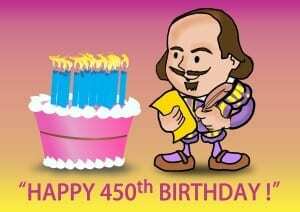 Happy birthday William Shakespeare! #shakespeare450. Four hundred and fifty. May you have many many more. As we look back on the four and a half centuries since Shakespeare was born we cannot but be overwhelmed by the influence he had on the world – in so many ways. Philosophically, poetically, linguistically and even, yes, morally – when you consider the meanings of his stories – he was unparalleled. But in 1564, the year the baby William was launched into the world, there were other giants already here. Queen Elizabeth 1 was about to mount the throne of England. As monarchs go she was pretty influential. And on the day Shakespeare was born her great mariner, Francis Drake, 22, was on his first voyage to the Americas, sailing with his cousin, Sir John Hawkins, on one of the fleet of ships owned by the Hawkins family of Plymouth. One of the most famous Europeans who ever lived died during that year. Martin Luther transformed the world but he was not a very nice man so we will move on to John Calvin, who died almost exactly a month after Shakespeare was born. But it’s far more pleasant to think about another Englishman, Christopher Marlowe, and the Italian Galileo, both born in the same year as Shakespeare and who had a more positive effect on the world than the two religious reformers. And while the three mothers were nursing their babies, never thinking about what giants those cute little boys were to become, another writer, the young Cervantes, was labouring away, about to publish his first fiction, La Gitanilla. No doubt he was already thinking about the great work that was to lead the way in fiction writing. That great work to come even influenced Shakespeare, as the English playwright wrote a play, Cardenio, based on an episode in Don Quixote. Cervantes’ great book had already been translated into English and it has become, along with Shakespeare’s plays and the books of the Bible, one of the most translated books in history. Sadly, Cardenio was lost. Also, the world was growing fast when Shakespeare and his fellow little giants were being born. The voyages of discovery were pushing the borders of geography and thought and imagination further every day. In 1654 the French Huguenot explorer, Rene Goulaine de Laudonniere sailed from France to establish Fort Caroline, now Jacksonville, in America. Meanwhile, voyages round the Cape at the tip of Africa were becoming routine, as a means of most efficiently carrying out the spice trade with India. In 1564 an account of the shipwreck of the São Bento near the Great Fish River in the East Cape, South Africa, by mariner Manuel de Mesquita Perestrelo was published in Portugal. It is the oldest book dealing exclusively with events on South African soil. Shakespeare was born into a world where some of the greatest works of art imaginable in Western cultural history were being made with paintbrushes and chisels: Michelangelo died a month after Shakespeare was born. And that leads one to think about painting, drawing, sculpting and writing technology. 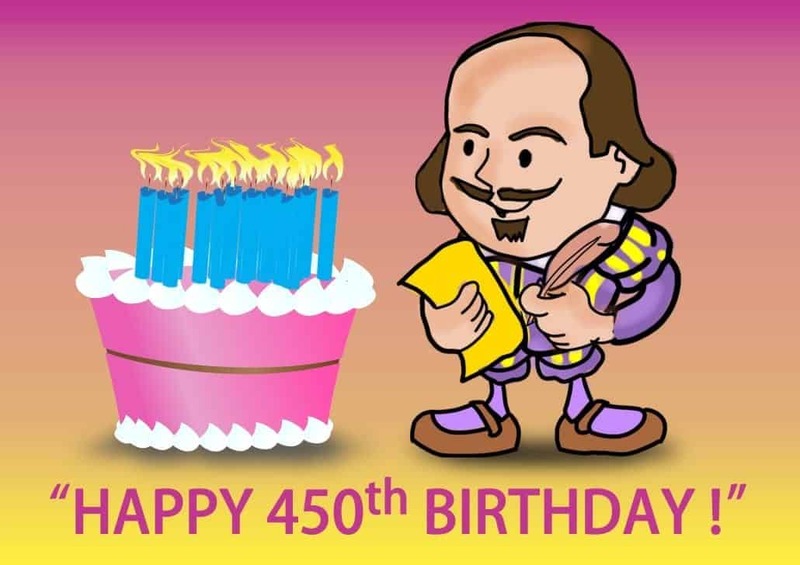 One of the stock images of Shakespeare is that of the bard with a long quill pen and a large bottle of ink. Scholars do not doubt that he did write like that, but how many people know that the humble pencil was invented in the year in which he was born? Yes, the pencil almost as we know it today, in 1564 was invented when a huge graphite mine was discovered in England. The pure graphite was sawn into sheets and then cut into narrow square rods. The graphite rods were inserted into hand-carved wooden holders to make pencils. They were called lead pencils by mistake – at the time, graphite was called black lead or plumbago, from the Greek word for lead. The name ‘lead pencil’ has, like Shakespeare’s plays, been with us for more than four centuries. And so, Shakespeare, happy birthday. For you’re a jolly good fellow, which nobody can deny. 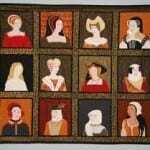 Shakespeare Baby Names For Girls Royal Family Split Over Shakespeare Authorship Debate!